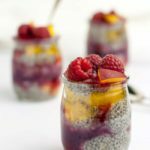 A simple, straightforward recipe for Raspberry Peach Chia Seed Pudding with suggestions for flavour variations. A healthy dessert, afternoon snack, or even breakfast! Paleo and vegan. Have you made chia seed puddings? 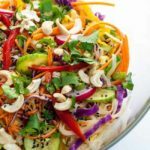 They’re quick and easy, super nutritious and absolutely delicious! This Mini Raspberry Peach Chia Seed Pudding is my latest favourite flavour. With fresh raspberries from the farm down the road and farmer’s market peaches, I made this paleo and vegan snack and layered it in tiny pots. Dessert? Yes. Breakfast? You bet? Afternoon power snack? Yes please. Chia seed puddings require no effort and no cooking. Simply combine a plant-based milk (I used unsweetened almond milk) with chia seeds and some honey or maple syrup and let stand until thickened, about an hour or so. Chia seeds absorb liquid and swell, making a thick creamy pudding. Mixed with fruit they make a tasty parfait! For this Raspberry Peach Chia Seed Pudding, I made a quick raspberry sauce with puréed raspberries and honey. I alternated layers of the pudding with the sauce and diced fresh peaches, topped the mini jars with fresh berries, and they were ready to eat! 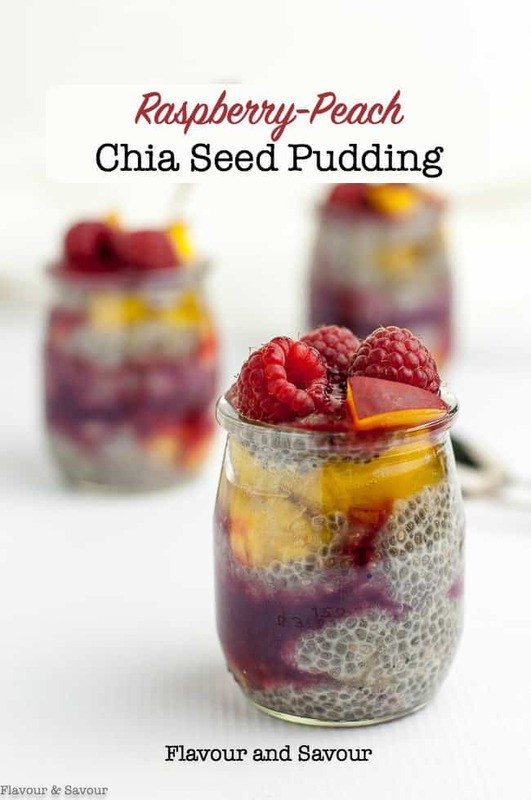 Chia seeds are a great way to get that full feeling and this pudding is an easy way to add more chia to your diet. And why should you do that? Those tiny seeds are a powerhouse of nutrition! Just 1 ounce of chia seeds (which is equal to about 2 tablespoons) packs 11 grams of fiber and 4 grams of protein, not to mention Omega-3’s, calcium, and other essential vitamins and minerals. Besides their nutritional value, they are non GMO, naturally gluten-free and contain high levels of antioxidants. You NEED to make this chia seed pudding! How cheerful are these funky colours? I like the contrast but if you want a lighter coloured pudding, you can use white chia seeds instead. 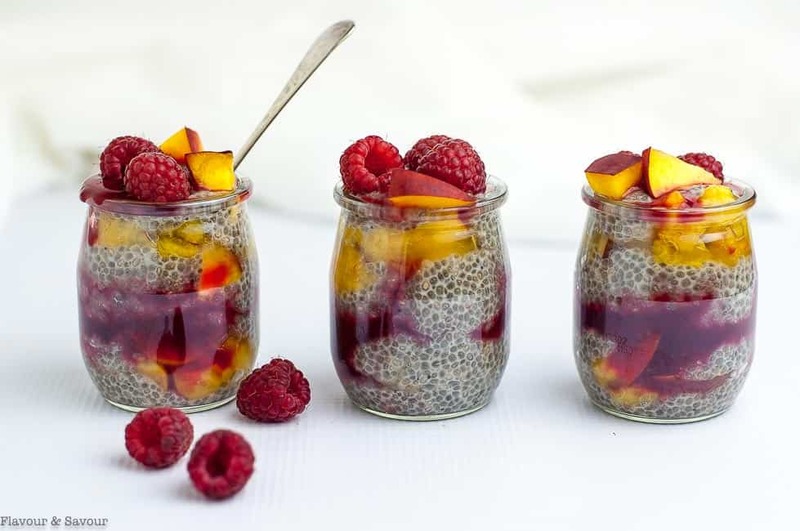 How long will this Raspberry Peach Chia Seed Pudding last? Stored in the fridge, these paleo and vegan chia seed puddings will last for about 5 days. 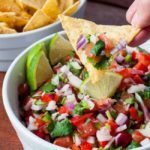 Perfect for Sunday meal prep! Mix up a batch, let it work it’s thickening magic in the fridge overnight and they’ll be ready for breakfast or dessert every day of the week. What other flavours can I make? 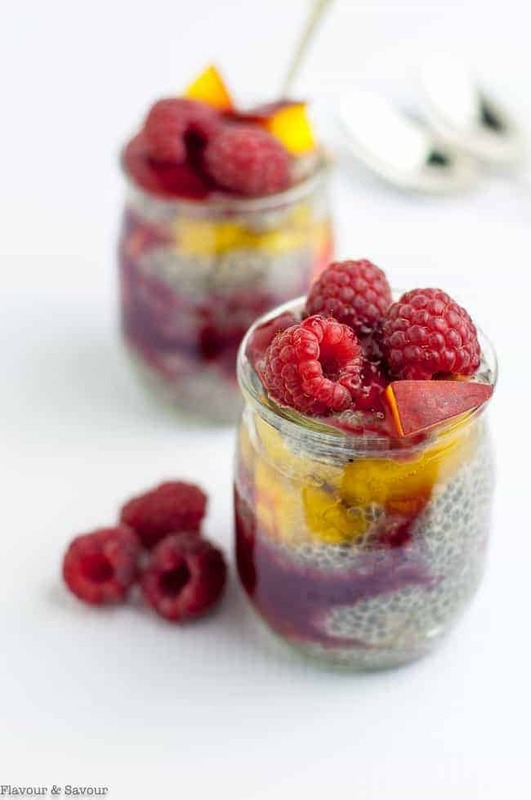 Fresh fruit is delicious in chia seed puddings. I’ve made them with fresh cherries and toasted almonds, with strawberries and a touch of vanilla extract and with a mixture of blueberries, raspberries and blackberries. You can also make them creamier by whirring the mix in a blender if the texture bothers you. Want an extra creamy pudding? Just add 1 cup of Greek yogurt. Are you a chocolate fan? Stir in 1 tablespoon of cocoa powder and add a tablespoon or two of almond butter for a richer taste. So good! 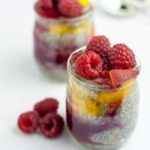 A simple, straightforward recipe for MIni Raspberry Peach Chia Seed Pudding with tips and suggestions for flavour variations. A healthy dessert, afternoon snack, or even breakfast! 1 cup plant-based milk, almond, cashew, coconut, etc. Combine milk, chia seeds, honey (or maple syrup) and salt in a measuring cup or small bowl. Let stand for 30-45 minutes or until thickened, stirring part way through as the seeds tend to sink to the bottom (or refrigerate overnight). Set aside a few raspberries for garnish. Mash remaining raspberries with a fork and combine with honey or maple syrup, OR whir in a blender or small food processor to make a smooth sauce. Layer in mini serving glasses, alternating pudding with fruit twice. Garnish with a few raspberries and diced peaches and serve. Cover any leftovers. 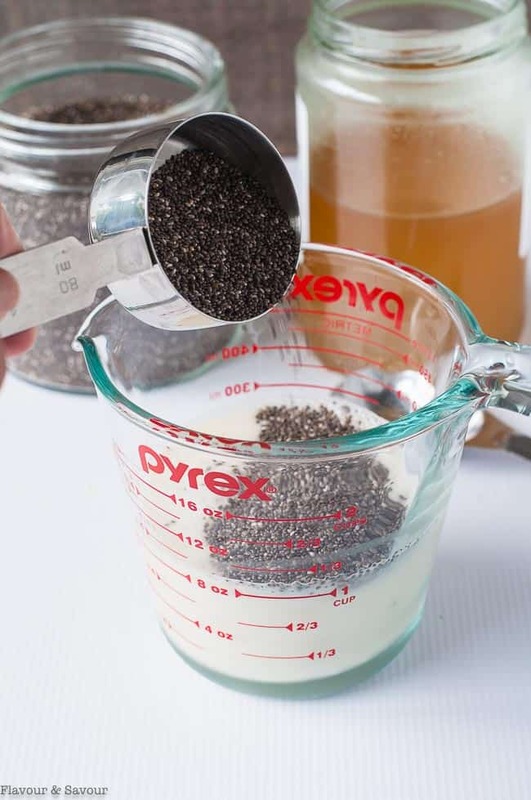 This chia seed pudding will last 3 - 5 days in the refrigerator. I made these on the weekend to have during the week. My family loved them! I didn’t have raspberries so I used blueberries instead. Thank you for a great recipe! Mmmm! I’ll bet they were great with blueberries. Great idea to use whatever you had in the fridge! 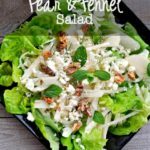 I made this for a snack for us last night, and I’m sure it will be on constant repeat! There must be many variations that will work well with it. There sure are, Cathy! Add your favourite fruit, or whatever is in season. 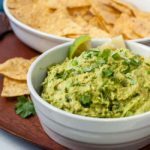 It’s a great healthy snack to have on hand in the fridge, and it’s so easy to whip up.